The GOLDEN ALLIANCE COIN team has announced the token sale for implementation of a modern gold mining innovation project on the basis of blockchain technology. The campaign is to be launched on November 27, 2017, and will last for 31 days. “We are sure that we offer excellent investment opportunities for all those who would like to diversify their portfolios with investments in ore mining projects, taking into account that, according to Metals Focus analysts, the gold price will show an upward trend, which will have a positive impact on the income of gold mining companies in various countries of the world,” noted Oleg Pavlyuk, director for corporate development and legal affairs. During the ICO, the campaign intends to raise USD 50 million to invest into the project portfolio of the GOLDEN ALLIANCE consortium. USD 25 million is planned to be used to purchase 25% of GOLDEN ALLIANCE. The funds exceeding this amount will be invested in the future portfolio of gold and other ore mining GOLDEN ALLIANCE projects. GOLDEN ALLIANCE COIN, due to its gold, silver and other metal reserves at the fields, which are proved by international companies, guarantees investments within the ICO by gold reserves. Investors will be able to make additional significant profit from the company’s investments in exploration, verification and extraction on the fields and at new mines the company plans to explore. 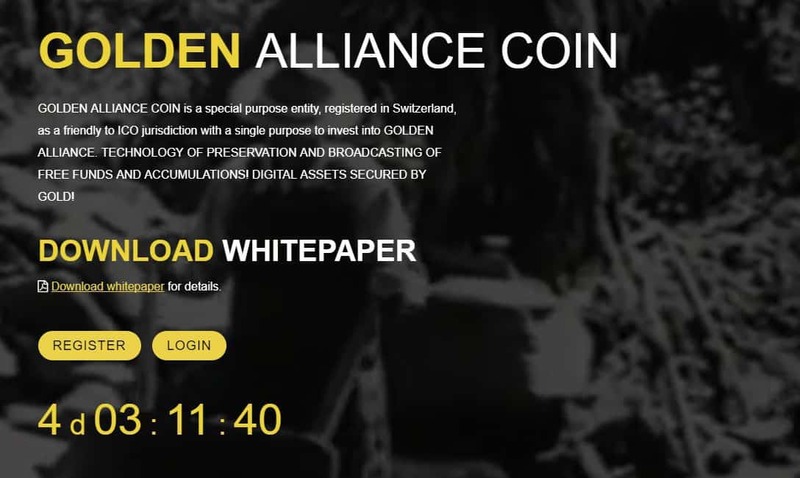 For the first time, GOLDEN ALLIANCE COIN plans to issue not only its own electronic cryptocurrency, but also its standard in the form of golden coins and gold bars of various values. According to the company’s representatives, these golden coins will have their own quotations and their value will depend not only on the value of gold they will be made from, but also on the value of Golden Alliance tokens (GDA) at the cryptocurrency exchanges. Thus, the value of Golden Alliance tokens (GDA) should not be lower than the value of its golden equivalent. Moreover, the company will be able to pay a part of profits to the investors both transferring funds in cryptocurrency and, upon the wish of investors, in golden equivalent. In its turn, GOLDEN ALLIANCE enables external investors to purchase a part of its portfolio by bringing it to market via ICO, as well as creates an opportunity to gain profit through the volatility of token market price. Out of a total of 500 million Golden Alliance tokens (GDA) 90% tokens will be available for purchase, 8% will be payed to the project team and spent on its promotion, and 2% will be spent on the bounty-campaign. Moreover, special bonuses will be offered to participants within the framework of the token sale. Thus, 25% discount for the purchase of tokens will be provided on the first day. By the end of sales, it will be possible to buy tokens with 10% discount. GOLDEN ALLIANCE COIN has elaborated a model of future profit distribution for token holders using a token repurchasing mechanism. Tokens will be issued as debt obligations. As a limited partner, GOLDEN ALLIANCE COIN will get a share in GOLDEN ALLIANCE and undertakes to use it for repurchasing tokens (100%) at the market price using the net profit made from development of fields and mining of gold, silver and other metals. Repurchasing of tokens seems to be very attractive for investors due to their liquidity and volatility. International experts note that gold and other precious metals remain the most important asset class for almost every investment portfolio and the best store of value. GOLDEN ALLIANCE is an international investment consortium of mining and consulting companies founded to make profit from implementation of gold ore and other mining investment projects and to increase investors’ income by means of gradual increase in the real value of assets and their liquidity. The scope of activities includes selecting and purchasing investment attractive facilities of subsoil use (enterprises, fields and promising deposits of mineral resources), implementing investment projects based thereon to establish efficient enterprises, managing these projects, and raising funds for their implementation. Since its establishment, the group has gained considerable experience in managing ore mining projects, which have received investments for exploration, evaluation and development of solid mineral fields, primarily gold, as well as for development and adoption of innovative technologies in mining and processing industries. The projects are implemented by professional and skilled expert team with more than 30 years of experience in ore mining industry.